This article is about the incident in the 1992 Los Angeles riots. For the English actor, see Reginald Denny (actor). The attack on Reginald Denny was a racially motivated hate crime in the 1992 Los Angeles riots in which Reginald Denny, a white construction truck driver, was beaten nearly to death by a group of black men who came to be known as the "L.A. Four". The attack was captured on video by a news helicopter, and broadcast live on US national television. 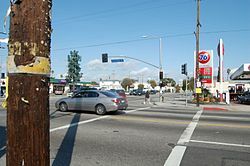 Looking east from the southwestern corner of Florence and Normandie, in March 2010. On March 3, 1991, plumbing salesman and amateur videographer George Holliday recorded motorist Rodney King at the end of a police pursuit, being beaten by Los Angeles Police Department officers. The outrage resulting from the acquittal of these police officers was the principal cause of the 1992 Los Angeles riots. On April 29, 1992, at 5:39 pm, Denny loaded his red dump truck with 27 tons (25.5 t) of sand and began driving to a plant in Inglewood, where the sand was due. He left the Santa Monica Freeway and took a familiar shortcut across Florence Avenue to get to his destination. His truck had no radio, so he did not realize that he was driving into a riot. At 6:46 pm, after entering the intersection at Normandie, rioters threw rocks at his windows, and he heard people shouting for him to stop, forcing him to do so in the middle of the street. Antoine Miller climbed up and opened the truck door, giving an unidentified man the chance to pull Denny out and throw him on the ground. Henry Watson stood on Denny's neck to hold him down as a group of men surrounded him and Anthony Brown kicked him in the abdomen. Miller searched Denny's back pockets before climbing into the truck and running off with a stolen bag. As Watson walked away, two other unidentified men joined in the attack: one hurled a five-pound oxygenator stolen from Larry Tarvin's truck at Denny's head, and the other kicked him and hit him with a claw hammer. As Denny tried to stand up, Damian Williams threw a piece of brick at the side of his head, which knocked him unconscious. Williams pointed and laughed at Denny, did a victory dance in the road, and flashed gang signs at news helicopters, including that of Robert Tur and his wife, Marika Gerrard, who were televising the events live from above. Brown joined Williams in flashing gang signs and spat on Denny. One man stood over him, filming Denny as he lay bleeding on the ground but did not try to help him. Denny remained on the ground next to his truck, bloodied and unconscious as some residents threw bottles at him. Gary Williams approached Denny and rifled through his pockets before fleeing. As Denny slowly came to and got up to his knees, the man who had earlier assaulted him with a hammer ran up and gave him a flying kick to the face. On the other side of the truck, Lance Parker stopped on his motorcycle and attempted to shoot the fuel tank with a shotgun but missed, before driving off. Bobby Green Jr., Lei Yuille, and Titus Murphy and Terri Barnett (boyfriend and girlfriend), who had been watching the events on television, came to Denny's aid. Denny eventually dragged himself back into the cab, and drove away from the scene slowly and erratically. Green (also a truck driver), boarded Denny's truck and took over at the wheel and drove him to the Daniel Freeman Hospital in Inglewood. Those who helped Denny were recognized by the City of Los Angeles, TRW trucking, and Washington Mutual Bank (now Chase Bank). Paramedics who attended to Denny said he came very close to death. Soon after Green brought Denny to the hospital, he suffered a seizure. His skull was fractured in 91 places and pushed into his brain. His left eye was so badly dislocated that it would have fallen into his sinus cavity had the surgeons not replaced the crushed bone with a piece of plastic. A permanent crater remains in his forehead despite efforts to correct it. Reginald Oliver Denny (born January 22, 1956), was a 36-year-old construction dump truck driver. On the first day of the rioting, Denny was attacked by several men, pulled from his International Road Tractor and brutally beaten, sustaining serious head trauma and other injuries. Denny's ability to speak and drive were affected by the attack, and he had to undergo years of rehabilitative therapy. During his recovery, he received over 27,000 get-well cards from supportive members of the community. The "L.A. Four" was a nickname given to the first four men charged with the attack on Denny: Damian Williams, Henry Watson, Antoine Miller, and Gary Williams. Two additional men, Anthony Brown and Lance Parker, were also charged with the attack on Denny but not until after the "L.A. Four" nickname had spread. The six were redubbed the "L.A. Four Plus". Damian Monroe Williams (born March 17, 1973) was a 19-year-old with a criminal record including arrests for battery, robbery, resisting arrest, and hit-and-run but no convictions. A football star in high school, he dreamed of becoming a professional football player and briefly played in a semi-professional league. When he was 16, he dropped out of school and became a member of the 71 Hustlers (an affiliation of the Eight Tray Gangster Crips) and had a three-month old son at the time of the incident. Less than an hour before his attack on Denny, he witnessed his older brother being arrested by police and was seen at the intersection assaulting and robbing an Asian man. Williams became one of the more recognized participants of the L.A. riots due to the live news broadcast of his attack on Denny and his somewhat memorable nickname, which was repeated frequently in news media. Henry Keith Watson was a 27-year-old former US Marine and an ex-convict who had served time for armed robbery. After his release from prison, he married, had a daughter, and was working two jobs at the time of the incident. Before assaulting Denny, Watson was seen near the intersection in a bloodied shirt and kicking truck driver Larry Tarvin in the head. Antoine Eugene Miller (May 5, 1972 – February 8, 2004) was a 19-year-old who lived with Damian Williams' family. Miller's mother was a drug addict, so as a child, Miller was sent to live with his grandmother. When he was 12, his grandmother killed his grandfather during an argument and was convicted of his murder, leaving Miller homeless. Miller had previously been arrested for misdemeanor drug charges, joyriding, and failing to appear in court. Before the attack on Denny, Miller was seen looting several motorists of their belongings. Gary Anthony Williams was a 33-year-old crack addict described as a "drifter" and a "hustler" who begged at a local gas station. Although he claimed to work there, his arrest record listed him as unemployed. On May 12, outgoing Los Angeles police chief Daryl Gates started a search for three of Denny's attackers, who were identified from the video of the beating. Gates himself arrested Damian Williams, while other officers arrested Henry Watson and Antoine Miller. Soon afterward, Gary Williams gave himself up to the police. The three arrested men were suspected to be part of the Eight Trey Gangster Crips. Judge John W. Ouderkirk granted Miller a separate trial on the grounds that the strong evidence against Watson and Damian Williams could harm his case; Miller was sentenced to 17 months in jail and 27 months on probation. Gary Williams was sentenced to three years in jail for attempting to rob Denny and assaulting another man. Edi M.O. Faal was Damian Williams' defense attorney, and Earl C. Broadly was Henry Watson's. On July 28, 1993, Watson's and Williams' trial began. The two were charged with the assault of Denny as well as five other motorists and two firefighters who were driving past the intersection of Florence and Normandie shortly after the start of the Los Angeles riots on April 29. At the trial, Denny faced his attackers for the first time since they had assaulted him. On August 12, 1993, a jury of five whites, three blacks, three Latinos, and one Asian was chosen. As in the Rodney King police trial, the prosecution relied heavily on video shot by a third party, this time in a helicopter. They also planned to build up portraits of Watson and Williams as criminals, antisocial, and beyond likelihood of rehabilitation and redemption. On August 19, Deputy District Attorney Lawrence Morrison delivered the opening statement and a week later, the videotape of the beating was shown. The doctors who treated Denny testified, describing his wounds and their efforts to repair them. Next to testify were witnesses of the beating and Denny's rescuers. The prosecution rested on September 17, 1993. The defense began pleading on September 20, making a case for unpremeditated assault, with Faal challenging the video evidence and portraying Williams as a victim of poverty and racism. In the closing arguments, the defense attorneys claimed that Williams and Watson were being used as scapegoats for the L.A. riots. The prosecution counter-argued that the two had knowingly tried to kill Denny and were not victims. After a few jury changes, a hung jury resulted for all charges except a felony count of mayhem for Williams and one misdemeanor assault charge for both Williams and Watson on October 18. Watson was given credit for time served and was sentenced to three years probation for the assaults of Denny and truck driver Larry Tarvin. Williams was denied bail and sentenced to a maximum of ten years for the assaults of Denny and four other people on December 7, 1993. As the families of the defendants celebrated the lesser sentences, Denny surprisingly approached Williams' mother, Georgiana, and hugged her. For weeks afterwards, public debate about racism and whether the verdicts were just or unjust raged on. As a result of the injuries he suffered during the attacks, Denny had to undergo years of rehabilitative therapy, and his speech and ability to walk were permanently damaged. After unsuccessfully suing the city of Los Angeles, Denny moved to Arizona, near Lake Havasu, to work as an independent boat motor mechanic. Denny has largely avoided the media and rarely speaks publicly about his ordeal. In 1997, Damian Williams was released from prison early for good behavior, but in 2003, he was sentenced to 46 years to life in prison for the 2000 murder of drug dealer Grover Tinner. He currently resides at Centinela State Prison. After his trial, Watson appeared on The Phil Donahue Show where he personally apologized to Denny and shook his hand. Watson was re-arrested and sentenced to three years for a narcotics conviction, and after his release, owned and operated a limousine service in Los Angeles. On February 1, 2004, Antoine Miller was shot outside of a Hollywood nightclub during an altercation and died in Cedars-Sinai Medical Center on February 8 at the age of 31. Gary Williams, Henry Watson, and Damian Williams gave interviews about the riots for John Ridley's 2017 documentary Let It Fall: Los Angeles 1982–1992. The best available footage of Denny's beating on April 29, 1992, was filmed by Marika Tur from a helicopter piloted by her then-spouse, reporter Robert Tur. Together, they operated a company called Los Angeles News Service (LANS). In the rush to cover the riots as they developed, dozens of television networks and stations around the world simply copied and aired the LANS footage without permission. LANS sued nearly all of them in federal court for copyright infringement; at least one of these lawsuits was successful. The last case was finally settled in 2004. Only a handful of stations, mostly in California, already had preexisting agreements with LANS or waited to negotiate agreements before airing the footage, and thus were not sued. In July 2006, LANS sued the site YouTube in the United States District Court for the Central District of California, for copyright infringement. LANS alleged in the lawsuit that, in the space of one week, a version of the video uploaded by a YouTube user was viewed over 1,000 times via the site. They argued this hurt their ability to license the video. YouTube requested summary judgment based on DMCA safe harbor, which was denied. LANS voluntarily dismissed the case without prejudice, planning to join a class action against YouTube in New York. YouTube appealed both the dismissal and the summary judgment ruling. However, the United States Court of Appeals for the Ninth Circuit dismissed the appeal. ^ a b "COGNITECH THINKS IT'S GOT A BETTER FORENSIC TOOL". Cognitech Thinks It's Got a Better Forensic Tool. L.A.TIMES. September 5, 1994. Retrieved 2011-06-29. ^ "LAPPL - Los Angeles Police Protective League: Controversy over Rodney King beating and L.A. riots reignites". Lapd.com. Archived from the original on 2015-04-17. Retrieved 2015-06-06. ^ "The L.A. Riots: 15 Years After Rodney King - Key figures: Bobby Green (also a truck driver)". time.com. Retrieved 2016-11-14. ^ Harris, Mary (April 27, 2012). "2002 Interview: Reginald Denny Looks Back on the LA Riots, Get-Well Cards". KNBC. ^ Johnson, Malcolm (1996-06-15). "`Twilight': A Unique Tour De Force At Long Wharf". Hartford Courant. Retrieved 2012-06-10. ^ a b "Damian Williams". The L.A. Riots: 15 Years After Rodney King. TIME. April 27, 2007. Retrieved 2008-04-10. ^ a b c Newton, Jim (May 25, 1992). "Denny Suspects Are Thugs to Some, Heroes to Others". Los Angeles Times. ^ a b Timothy Goldman (11 April 2012). "LOS ANGELES RIOTS (PART II OF V)" – via YouTube. ^ a b c d Gray, Madison (April 27, 2007). "Key Figures: Reginald Denny". Time. ^ Munoz, Hilda (May 3, 2003). "Figure in '92 Riots Convicted of Murder". Los Angeles Times. ^ Jordan, Billie (April 29, 2017). "25 Years After L.A. Riots Damian 'Football' Williams Reflects On His Life And Role In The Rebellion". Eurweb.com. ^ Hall, Jane (November 9, 1993). "Watson Apologizes for Denny Assault : Television: The two meet at "Donahue" show taping. Denny is forgiving, but many in audience seem unsatisfied by his assailant's statement". Los Angeles Times. ^ Gray, Madison (2007). "Key Figures: Henry Keith Watson". Time. ^ Blankstein, Andrew (February 12, 2004). "Man Guilty in '92 Denny Attack Dies". Los Angeles Times. ^ "Let It Fall". ABC News. ^ "Los Angeles News Service v. KCAL-TV Channel 9, 108 F.3d 1119 (9th Cir. 1997)". Summaries of Fair Use Cases. Fairuse.stanford.edu. ^ "Tur v. YouTube, Inc". Law.justia.com.